Every sport, hobby, or business has a collection of special terms, sometimes called ‘jargon’. One engineering company I worked for had an extensive list of acronyms in the jargon. The acronyms were so confusing that one overachieving engineer developed a glossary of terms for sharing with new employees. Actually, the senior employees used it the most! With pinewood derby racing there is also a jargon. It may not be as extensive as that used in other hobbies, but it is still quite large (in fact much larger than I thought, as I discovered when creating it). So, to help those of you who have not yet graduated to ‘pinehead’ status, I have compiled a glossary of pinewood derby terms. This list is certainly not exhaustive, so if you know of terms that I have missed, please email them to me and I will update the glossary at a future date. Due to the length of the glossary, I will be dividing it into two parts. The second part will appear in 4 weeks. Canopy – An enclosure, usually transparent, covering the driving compartment of a car. A decorative item on a pinewood derby car. 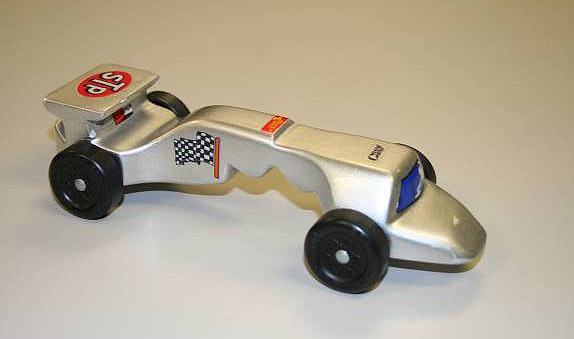 Cheater Bar – A high bar at the front of a pinewood derby car which rests against the starting pin. The intent of the device, to achieve a quick start, has been largely nullified by powered starting gates. Cowling – A covering over an engine. A decorative item on a pinewood derby car. Decal (Dry Transfer) – A very thin decal with pressure-activated adhesive transferred to a surface using a pencil or stylus. Decal (Water Slide) – A decal with water-activated adhesive transferred to a surface by first soaking the decal in water, and then sliding the decal off the backing sheet. Faring – A partial canopy used to reduce wind drag. A decorative item on a pinewood derby car. Spoiler – An air deflector mounted usually at the rear of a car to reduce lift at high speeds. A decorative item on a pinewood derby car. Wing – A horizontal part, mounted on the front or back of a car used for improved ground effects. 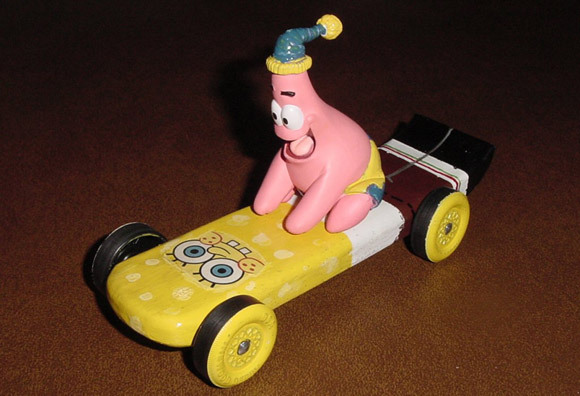 A decorative item on a pinewood derby car. Barbs – Same as ‘Burrs’. Burrs – Flaws present under the axle head on nail-type axles. Crimp Marks – Flaws present on the axle shaft of nail-type axles. Groove – Radial scores cut in the axle shaft as a speed technique. Head – The portion of the axle that rubs on the outside hub of the wheel and keeps the wheel on the axle. Holes – An alternate axle mounting technique whereby holes are drilled into the sides of the car body into which the axles are inserted. Point – The portion of the axle on nail-type axles opposite from the head, which is embedded in the car body. Shaft – The portion of the axle on which the wheel rotates. Slots – Grooves cut into the bottom of the car body into which the axles are inserted. Solid-rod Axles – Long axles (2 per car), which extend the width of the car. The wheels are held onto the axle with plastic caps which snap onto the axle. 3-Wheel – A speed technique whereby a wheel (generally a front wheel) is slightly raised off the track surface. High Nose (aka barge) – A technique with a goal similar to a ‘cheater bar’ where the front edge of the car is higher than usual. Orbiting – A detrimental condition where a wheel revolves around the axle in an elliptical (orbiting) pattern instead of a circular pattern. It is enabled by too little weight on the wheel, lack of lubrication, or axle/bore flaws. When orbiting occurs, a vibrating noise is heard, followed by a rapid deceleration. Raised Wheel – Same as ‘3-Wheel’. Shim Method – An alignment technique developed by Stan Pope which uses shims to make fine adjustments to the position of each wheel. CA – An adhesive (cyanoacrylate) with a fast drying time. Commonly known as Superglue, it is typically used for making quick repairs. Epoxy – A two-part adhesive used to join dissimilar materials. Commonly used for attaching metal parts to the wooden car body. Hot – A heated adhesive dispensed from a gun. White – A water-based adhesive used for attaching wood to wood. Yellow – A water-based adhesive used for attaching wood to wood. Stronger than white glue, this adhesive is also known as Carpenter’s Glue. Awana – Awana is an international, Bible-centered, non-denominational, evangelical organization for preschool through high school. Generally, grades 3 through 6 (or all ages) participate in pinewood derby racing, known as the Awana Grand Prix. BSA – The Boy Scouts of America is a nationally chartered organization that encompasses Cub Scouts, Boy Scouts, Explorer Units, and Varsity Units. Cub Scouts participate in pinewood derby racing. Chule Car – A name used by the Y-Guides for their car kit. The kit is the same one used by the Royal Rangers. Royal Rangers – Royal Rangers is an international, Bible-centered, Assemblies of God-sponsored, organization for boys in grades K-12. Royal Rangers also use the term pinewood derby, but use a unique kit with screw axles and dowel rod axle supports. Graphite – Powdered carbon lubricant. Can be coarse or fine. Generally, the lubricating property increases with the carbon percentage. Molybdenum – An element that when finely ground can be used as a lubricant, or as a lubricant additive. It appears as a fine black powder when ground. PTFE – A white powdered lubricant (generic for Teflon). Dry-White is a brand name. Silicon – A non-oily lubricant that is generally packaged as an aerosol. Boron Nitride – A white powdered lubricant, similar in appearance to PTFE, but generally performs better than PTFE when used on Pinewood Derby Cars. NyOil II – A thin film oil lubricant. SB-10 – A thin film oil lubricant similar to NyOil II. Camber – The alignment of the front and/or rear wheels of a vehicle closer together at the bottom than at the top. A specific type of ‘cant’. Cant – The alignment of the front and/or rear wheels of a vehicle in which the top distance apart is not the same as the bottom distance apart. Sometimes, pinewood derby wheels are set such that the top distance is less than the bottom distance. COG – The Center-Of-Gravity of an object. In pinewood derby racing, the front-to-back COG is commonly called the Balance Point. ID – The Inside Diameter of a cylindrical object, such as a wheel bore. Lateral Runout – The amount of deviation of the wheel face as referenced to an imaginary perpendicular line through the bore (think of wheel wobble). MS – Milliseconds: Measurement of time in thousandths of a second. OD – The Outside-Diameter of a cylindrical object, such as the wheel tread. Radial Runout – The deviation from true of the wheel tread as referenced to the bore (think “out of round wheel”). RPM – The speed of a revolving device measured as Revolutions-Per-Minute. Runout – The amount of deviation from true (inaccuracy) of a rotating device such as a drill, lathe, or wheel. Toe-In – The alignment of the front and/or rear wheels of a vehicle closer together at the front than at the back (pigeon toed). Toe-Out – The alignment of the front and/or rear wheels of a vehicle closer together at the back than at the front. Acrylic – A water based paint with a fast dry time. Clear Coat – A final transparent coating applied over paint to increase shine and durability. Enamel – An oil-based paint which dries to a hard, glossy finish, however, the dry time can be lengthy. Lacquer – An oil-based paint which dries to a hard, glossy finish and has a fast dry time. A good alternate to enamel sprays is a lacquer such as Krylon brand paints. Primer – An undercoat of paint (usually) with less pigment applied to prepare a surface before painting. Sanding Sealer – A coating applied directly to wood to seal the grain. These products are often epoxy-based. Dremel – One brand of a small, high-rpm, drill-type device used for carving, polishing, and drilling. Commonly used for polishing axles and preparing wheels. Lathe – A device used for machining metal or wood. Metal lathes are commonly used for truing wheels, grooving axles, and other wheel/axle preparation steps. Crocus Cloth – A cloth backed sandpaper finer than ’emery cloth’. Emery Cloth – A cloth backed sandpaper. Grit – A rating as to the coarseness of sanding paper. A larger number indicates a finer paper. There are two rating systems. ANSI (CAMI USA) is the common system used in the United States. FEPA (EURO) is used in Europe and elsewhere. Jeweler’s Rouge – Any of a variety of mineral powders used for polishing. Red rouge (ferric oxide) is the most common, and is used for polishing axles. Mother’s – A brand name of a metal polish used for polishing axles. Pumice – A light, porous, glassy lava, used in powdered form as a polish for axles. Sanding Sponge – A sponge with a coarse surface used for sanding wood. Wet/Dry Sandpaper – A sandpaper (generally aluminum oxide) which can be used on wood, paint, or metal. When sanding paint or metal, the paper is first dipped in water. Tools, weight, wood, wheels, and race management terms will be provided in part 2. This is my son Joseph’s 2005 Pinewood Derby Car. The inspiration started in November of 2004 when we saw a ‘Patrick’ ornament at a local store. The ornament had Patrick riding a snow sled. We removed the sled and Patrick turned out to be the perfect size and weight. The build was easy as it just required one cut and some sanding. The painting took several days due to the numerous colors. He received the award for “Best Car That’s Not A Car” at the pack Pinewood Derby. It shows how you can think outside the box for some good ideas. This is a design that my son Michael sketched out. The car was made from an original BSA kit, We worked closely together, teaching him to use the coping saw, rasp, sand paper, and paint. Michael’s car was the fastest in the Pack, by a long shot. It weighed in at 5 ounces utilizing your tungsten cylinders. We trued the wheels, and cleaned the axles with pumice. NyOil II removed that last little bit of friction. Seeing my son so proud of his work and accomplishments is a moment sealed in time and memory! This is a picture of my daughter Ashley’s car. It took 1st Place in speed. It has an extended wheel base with axle holes and one wheel raised. The wheels are H-cut. The holes you see on the top are tapped, and I used set screws to hold the axles in place. The holes go all the way through, with wax paper shims underneath on the axle for wheel alignment. On the rear is a larger tapped hole with a polished brass plug that can be removed for weight adjustment. My son Alex worked very hard on his car. I tried to help as best as I could but being a single mom and not that talented with power tools, I prayed a lot. His design was a nice race car shape we found on your site. It seemed simple enough until the band saw had a mind of its own. In one fell swoop the nice race car shape became a wedge. I was a little worried, but after reading the hints on your site it seemed like it might have all happened for a reason. I then drilled the weight holes on the bottom and broke the first cardinal rule; I went right through the body. Again I was a little worried but it looked like a logical place for the racer’s head! I handed over the car and Alex set to work sanding, priming, sanding again. We made a windshield from a plastic soda bottle and he painted the final coat. Now it was time to weigh the car; it came in at 1.5 ounces! I guess I cut off more of the block than I realized. Panic set in. I scrounged up some flat metal and asked my brother to take them to work to be cut in the machine shop. The original idea of fishing weights nearly caused us to fall over with laughter – with a car at 1.5 ounces it was going to take more weights than car. Then after the final finish coat of clear acrylic the car fell and split in front. A little glue, some clamps and a few prayers got us back on track. We got the car up to weight, 4.97 ounces, and Alex had to repaint. Thinking that I had totally ruined my son’s first Pinewood Derby, we set off to the pack race. He was so excited when his car finished a full two car lengths ahead of the other Tigers. In all he took 1st Place in his Den, and he then raced the bigger boys and took 4th overall in the Pack. We celebrated with plastic stemware and ginger ale (champagne substitute)! Alex then raced at the Districts, and finished 21 out of 88 racers. We had a good time building together and I learned it does not matter that I am a single mom. We can still do ‘guy’ things together and have good results. Alex learned that it does not matter if he won or lost but that he did his best and that we can count on each other to get things done. In a previous newsletter you said that on a long track to put the weight farther forward. But in another place you said to keep the weight back towards the back of the car. Where did I get confused? Back weighting does give a higher speed when the car hits the flat. But since there is more weight in the back, the weight of the car is not evenly distributed, leading to most of the friction being on the rear wheels. This is fine for shorter tracks (up to around 45 feet). But on long tracks, the extra friction in the rear takes its toll, and the car will slow down faster than a center-weighted car. So the tradeoff is finding an optimal balance point, balancing the desire for higher initial speed with the need for maintaining speed on the flat. We advanced to the district level, but lost out to some good competition. My son had a car that fishtailed. What are the possible causes for fishtailing so that we can prevent it next year? Too much weight in the back – the front wheels don’t track well leading to wandering. Misaligned axles – make sure to test roll the car and ‘tweak’ the alignment to get it as dead-on as possible. Angled axles, bent axles, and/or anything other than axles parallel to the ground. Wheels with beveled or misshapen tread surfaces. This is especially a problem if the wheel surfaces are not all finished in exactly the same manner. I have a question about wheel shaping. We grooved the wheels in such a way as to cut away the entire outer edge of the wheel at an angle – creating a triangular look. This reduced the weight of the wheels considerably. 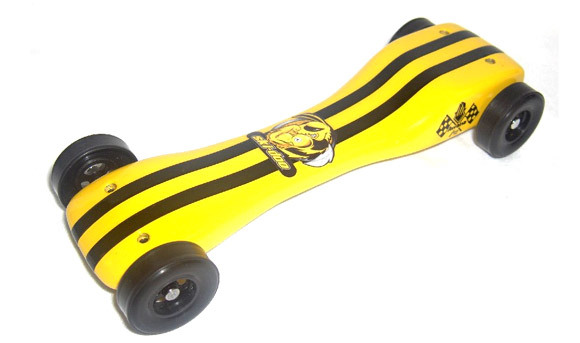 However, the wheels obviously cannot stand up on their own. After reading your booklet, I can now understand that this design would cause the wheels to tilt and create binding between the axle and wheel hub. Is it possible that the benefit of the lighter wheels more than compensates for the extra friction caused by our re-shaped wheels, or is the extra binding robbing us of speed? While lighter wheels do improve performance on standard tracks, I firmly believe that stable wheels give better performance. I don’t know the tradeoff point, so my suggestion is to lighten the wheels and retain stability. This can be done via H-Wheels, and/or by removing material from the under-side of the wheel surface. People do this by creating a thin tread – cutting from the underside – and by removing material from the inside wheel face. By doing this you can significantly reduce weight, but still retain a stable wheel.